Innovative steel crown release system (patented) at 8 o’clock for easy time setting. 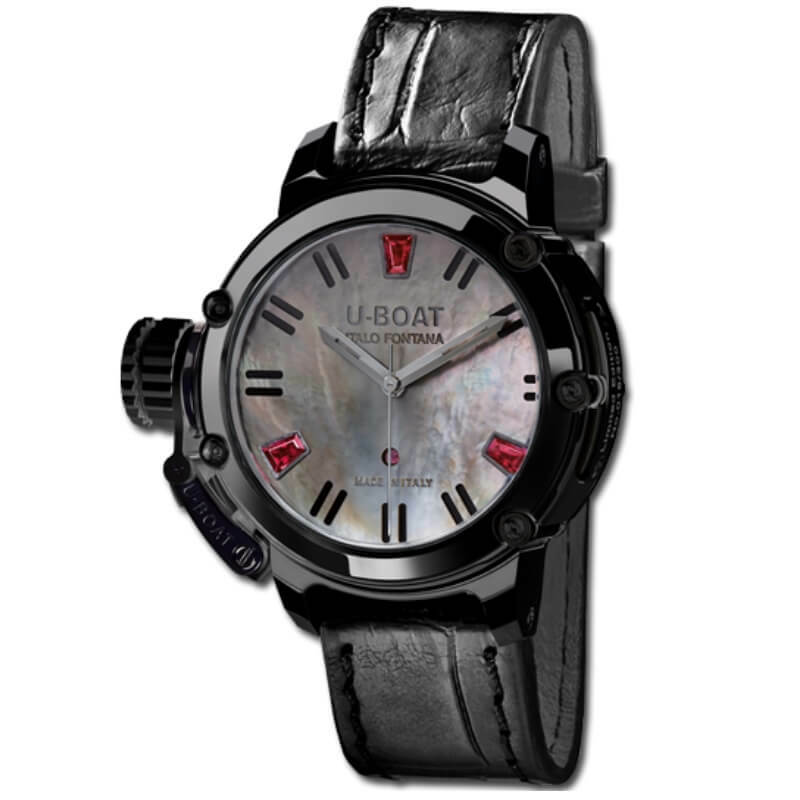 U-28 automatic mechanical, modified and personalized to U-BOAT specifications. AISI 316 Plus stainless steel with black PVD coating; 40 mm diameter. The bezel and case back are locked together by external tubing and a customized key that ensures total waterproofing. Oversized crown cap for easy handling, secured to the case in a distinctive position at 9 o’clock, with patented protection device. Personalized silver rotor consisting of a base and three bridges fixed with blue screws. Mother of pearl dial with three tapered rubies set on the indexes at 12/4/8 o’clock (0.43 ct.). Curved sapphire glass on the face and flat on the back of the timepiece. Hand made and hand finished alligator leather, black tongue buckle in steel with black PVD coating. Width 18/18 mm.